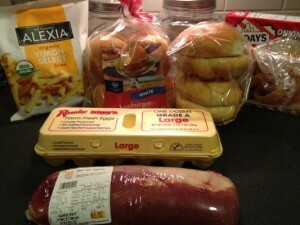 Pork Tenderloin is not the cheapest meat you can buy, but preparing it this way really stretches your budget. It really makes for filling sandwiches that everyone loves. Pairing it with Fries and/or onion rings makes for a nice meal. I used 2 pounds of meat and made 10-12 sandwiches! It was a little over $10, but there was a lot of meat left over. Each pork tenderloin weighs about a pound. 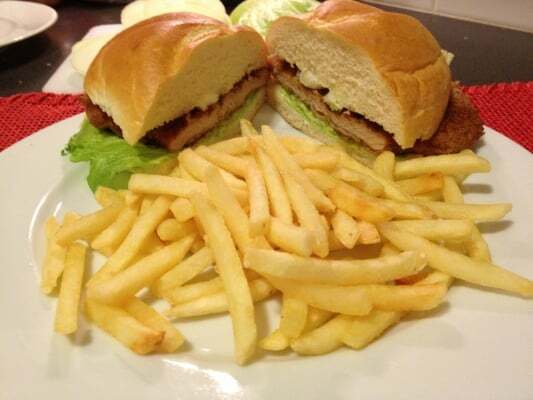 So for this we have two tenderloins. We start by dividing each tenderloin into 5-6 pieces. We then take each of those and butterfly it (cut about 3/4 of the way through and open it up). We take this either between wax paper or place inside a Hefty bag and pound it out to about 1/4 inch thickness. We combine the flour, onion powder, garlic powder and pepper and mix well and place in a large plate. Take the eggs and milk and mix together to make an egg wash and place in a large shallow dish. Finally, take another plate and fill with bread crumbs. Take a large skillet and add oil and bring to medium heat. You will probably need to add more oil every few tenderloins that you cook. 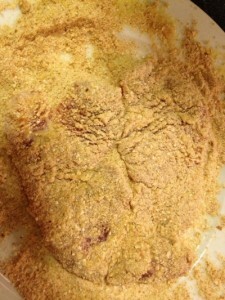 We begin by taking the pounded tenderloin and coat in the flour mixture on both sides, shaking off any excess. Dip it into the eggwash on both sides, allowing any excess to drip off. Then into the bread crumbs flipping to make sure both sides are coated. I tend to stack my coated tenderloins up until I have finished coating them all so I can clear up counter space. I then fry them two at a time in my cast iron skillet for about 2-3 minutes on each side. As you are doing these you can get your onion rings and french fries ready so that you’ll be all ready in the end. Add whatever you like to dress your sandwiches. Each pork tenderloin weighs about a pound. So for this we have two tenderloins. We start by dividing each tenderloin into 5-6 pieces. We then take each of those and butterfly it (cut about 3/4 of the way through and open it up). We take this either between wax paper or place inside a Hefty bag and pound it out to about 1/4 inch thickness. We combine the flour, onion powder, garlic powder and pepper and mix well and place in a large plate. 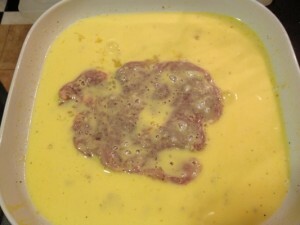 Take the eggs and milk and mix together to make an egg wash and place in a large shallow dish. Finally, take another plate and fill with bread crumbs. Take a large skillet and add oil and bring to medium heat. You will probably need to add more oil every few tenderloins that you cook. We begin by taking the pounded tenderloin and coat in the flour mixture on both sides, shaking off any excess. Dip it into the eggwash on both sides, allowing any excess to drip off. Then into the bread crumbs flipping to make sure both sides are coated. I tend to stack my coated tenderloins up until I have finished coating them all so I can clear up counter space. 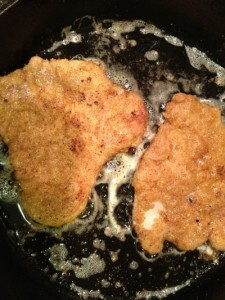 I then fry them two at a time in my cast iron skillet for about 2-3 minutes on each side. As you are doing these you can get your onion rings and french fries ready so that you’ll be all ready in the end. Add whatever you like to dress your sandwiches.